The story centers around a group of people that get lost during in the woods and -for no apparent reason- suddenly find themselves in 13th century Europe (the Netherlands, to be precise). They don't know how they got there and there doesn't seem to be much they can do about it, so they stay in a small town for at least year till they figure out what has happened to them. In the meantime they try and make a living for themselves. Some of them find work, some use their skills and knowledge from the future to make a living. One of them is a woman who has a dark skin. How would people in the middle ages react to a dark-skinned person? There is no harbor in town and it's quite small, so chances are they've never seen someone with a dark skin. However, they might know of their existence because of the crusades: the story is placed at the start of the 13th century in the middle of the 5th crusade (not that the protagonists were involved, but a lot of dutch people participated in it so it must have been a thing at the time). What would be a good occupation for my character? The original idea was to have her take on some medicinal activities, maybe even in disguise, but this was also at the time of witch burnings and such and I'm not sure how well people would've reacted to that. Any recommendations for research literature are also welcome! She can be an Ethiopian Christian Pilgrim. Would a small town in the Netherlands be aware that there might be a distant foreign Christian kingdom? Yes they would! Prester John (Latin: Presbyter Johannes) was a legendary Christian patriarch, presbyter (elder) and king who was popular in European chronicles and tradition from the 12th through the 17th centuries. He was said to rule over a Nestorian (Church of the East) Christian nation lost amid the Muslims and pagans of the Orient, in which the Patriarch of the Saint Thomas Christians resided. Your traveler can say she is on a pilgrimage to visit some Christian site and get a blessing to take back to her ill husband. The people will be interested in her because of her exotic provenance but more comfortable because she is christian and also interested in the local holy site. She can make her living telling stories of distant lands and peoples. Probably no-one will pay her gold for stories, but they will put her up and feed her. People of color were rare but not unheard of in those days. Gypsies in the East and Moors in the west were known to be slightly darker skinned. The most venerated Polish painting of Madonna depicts Her as dark skinned woman. The people knew that faraway lands had different races, you only need some reason to be in Europe. 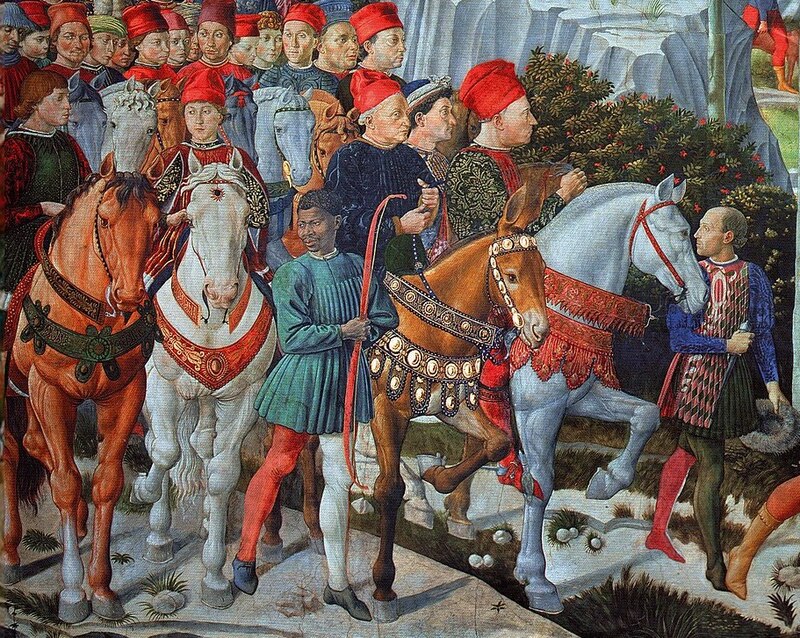 In medieval Europe your religion and social class were more important than skin colour. An independent woman was more suspicious than a dark skinned person. Most women had three choices - marriage, monastery or prostitution. Tell them you are a noble woman from the realm of Priest John. You were captured and enslaved by the Mohammedans and later rescued by your current friends. This gives you some sympathy from the very religious folk you meet. Explain that you can't go home because your country is separated from Christian Europe by the enemies. As a bonus, being a captive from faraway lands you can explain some of your knowledge. People can be bit more forgiving of the exotic wisdom. Medicine is a good idea, but don't push it too far. Being a Moorish witch is not much better than local witch. 2) It was the sacking of the Moors that led to many of the developments in mathematics and science within the Christian worlds from that time through a couple of centuries because the Moors had been spending considerably more effort in enlightening themselves than the Christians of the time. As an educated guess, your dark skinned time refugee would struggle socially, but the people of the Netherlands would express little concern or surprise at the technological or mathematical expertise of your traveler, assuming that she was a Moor. This would actually be a benefit to her because it's a convenient excuse as to why her language, customs, and occasional gaffes (like using Okay instead of All Right) may be forgiven. To be blunt, in that era she's going to get more resistance from being a woman than she is being black but if she knows what she's doing she could easily set herself up in midwifery. That wouldn't be seen as that big a leap for women at the time, she'd already know more than the women of the day in many respects, and perhaps most importantly, if she saves mother and child from some awkward situations a couple of times over, all thoughts of witchcraft will probably go away on the grounds that there's no deodorant quite like success in this field. Personally, I'd keep her away from technical or engineering fields - don't let her be a blacksmith or design buildings or do accounts for the local businesses. Their math was very different to modern mathematics for a start, and standing out in such fields, especially as a woman, is an ideal way to attract said unwanted attention of witch hunters. As per comments, several other important notes about this answer; First is that serious witch hunting progroms weren't in force in the 13th century, although some historical texts do point out that witchcraft was still something seen as suspicious in that time. Muslim learning was already being introduced into Europe during that time, although perhaps not as widely spread as it was to become during the reconquest of Spain. The comments below do provide such additional insights. The association between skin color and slavery is a pretty modern one. By the 1800s, Europeans had mostly stopped enslaving other Europeans, and Native Americans were no longer selling other Native Americans as slaves either. That meant that most slaves in existence happened to be from equatorial Africa, and thus they had black skin. Of course, there were also Europeans enslaved to Africans, but that was mostly in north Africa. Another other option is a pilgrim. The group can speak for her and with extensive robes remain hidden. Final option is to be blatant and open by being a travelling merchant from a far away land. There are dark skinned persons, and dark skinned persons. In 13th century Europe there were two groups of people who were strongly discriminated against: Jews (who were not "dark skinned") and Gypsies (who were "dark skinned"). People of North African or Arab descent (who are "dark skinned" Europoids) were not discriminated against because of their appearance, but rather because of their religion. People of sub-saharan African descent would have been perceived as exotic, and not discriminated against any more than any other stranger. Remember that in the Middle Ages anybody from a village more than a few miles away was a stranger, and people were generally strongly xenophobic. Ah, and witch burning is a modern phenomenon, not a medieval one. As long as the "dark skinned person" does not behave like a Gypsy, and has a convincing story how come they are Christian (of the correct variety of Christianism for the locale), all is fine. Not the answer you're looking for? Browse other questions tagged reality-check society medieval middle-ages or ask your own question.